Below is an example of a book review by Joan Masaryk. Joan’s reviews are published in ACRA’s newsletters, which are FREE to all ACRA members. 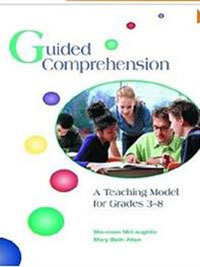 The beauty about this book is that for each strategy there is a complete lesson plan involving the three stages and a variety of direct instruction criteria. There are over 50 exceptional lesson plans for teaching previewing, questioning, making connections, visualizing, knowing how words work, monitoring, summarizing and evaluating. Each lesson plan includes teacher and student friendly black line masters. Each lesson plan includes purpose, comprehension strategy use, texts, procedure and additional educational sources. There are a variety of assessments: attitude surveys, interest inventories, literary histories, motivation profiles and a self-perception scale. This treasure-chest of assessments enables the teacher to know the students well and provide the books and strategies that meet student needs. about their students and the best teaching practices. This book holds the key to success for teachers and their students.